Oranges are famous for their high vitamin C content, but it may surprise you to hear what vitamins are in oranges other than vitamin C.
Oranges make a nutritional snack that's refreshing and easy to pack in a lunch or backpack without worrying about melting or leaking. They're loaded with vitamin C, are relatively low in calories, and can satisfy a craving for sweets. An orange provides about 70 mg of vitamin C to your diet. Not only does it fight the conditions listed above, but it also plays an essential role in the creation of sperm and is essential for the production of collagen. Collagen is necessary for healthy blood vessels, cartilage, joints and skin. Vitamin C is also vital in keeping your immune system healthy. It helps neutralize pollutants, plays a role in antibody production, boosts the absorption of nutrients, and thins the blood. What Other Vitamins Are in Oranges? Vitamin C found in oranges provides heavy-duty benefits, but there's more to the orange that vitamin C. Oranges provide additional nutritional benefits from many vitamins. Oranges are a good source of folate (40 mcg) which is the naturally-occurring form of vitamin B9. It works to stop neural tube birth defects, plays an important role in numerous other bodily functions, and is necessary for the production of healthy red blood cells in children and adults. Helps maintain healthy mucous membranes. Calcium - Unprocessed natural foods like oranges are rich in calcium. A whole orange provides around 52 mg of calcium. Potassium - One medium orange contains approximately 237 milligrams of potassium which is a dietary mineral that supports many vital health functions. Phosphorus - Along with calcium, phosphorus is needed for the development of healthy bones, teeth and nerve cells. An average orange provides about 18 mg of phosphorus to your diet. Magnesium - Magnesium is necessary for healthy bones, developing new cells, and works to trigger the B vitamins. Magnesium is also needed for insulin secretion and function and helps with the absorption of calcium, vitamin C, and potassium. One orange provides about 13 mg of magnesium. Selenium - Selenium works as an antioxidant in conjunction with vitamin E. One orange holds about 65 mg of selenium. 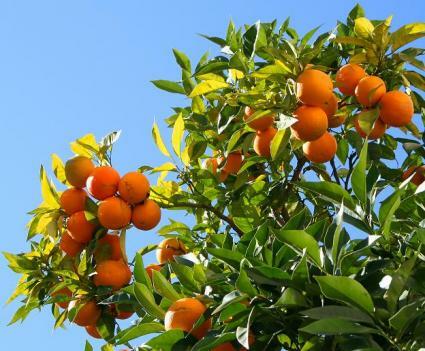 Dietary fiber - Oranges are also a good source of dietary fiber. An average orange provides 28 percent of the RDA of dietary fiber. Soluble fiber is instrumental in promoting good cardiovascular health. While oranges offer a host of beneficial vitamins, minerals and fiber, to get the most from what vitamins are in oranges, it's important that they be kept fresh. To keep your produce as fresh as possible, it is vital to refrigerate it because vitamin content gradually diminishes once an orange leave the tree.